You won’t believe what you can do with Storyline 2. That’s why we put together this list of gorgeous examples created by Articulate pros and E-Learning Heroes all over the world. 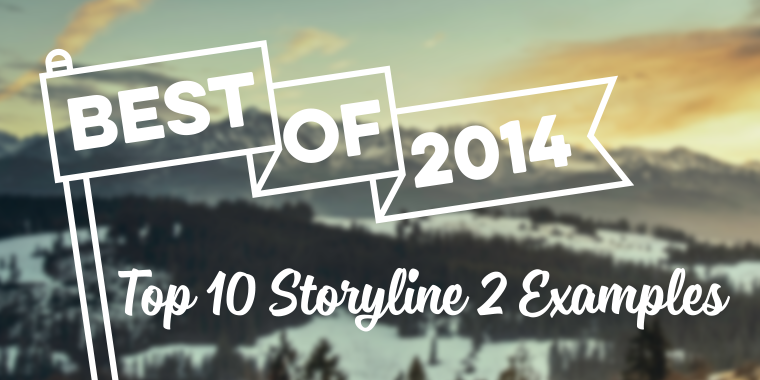 Dig into 2014’s top examples to get some inspiration for your next e-learning course. Enjoy! See how you can tempt learners’ curiosity with this menswear-inspired Digital Magazine from Tim Slade. See how you can make an interactive game in Storyline 2 with Nancy Woinoski’s Catch the Bicycle Thief interaction. Learn how you can use motion paths to create a really cool Click and Reveal Interaction in this example from Nicole Legault. See how you can help learners test skills and explore new information with this Paper Doll Interaction by Jackie Van Nice. See how you can build a cool, time-limited quiz with this Drag and Drop Game with Countdown Timer by Tim Slade. See how sliders can help you present complex information one morsel at a time in this Product Slider by Munesh Ramprashad. Check out tons of ways you can attract learners’ attention with cool sliders and motion paths in this wellness course by the Articulate crew. Looking for mobile course inspiration? Check out this Ebola crisis volunteer recruitment course from Unicorn Training. See how sliders can help you tell a story with this Faces of Ebola Slider Interaction from Jackie Van Nice. Prepare to drool while you explore multimedia content in this food-themed Digital Magazine by Kristin Anthony. Want even more? We’ve got tons of beautiful courses in our E-Learning Examples hub right here. Thanks Joanna! Such a nice surprise to see them here with these other great examples! I think one of the best new things to come out in 2014 was SL2's sliders. Who can resist coming up with groovy new ways to use them? ?